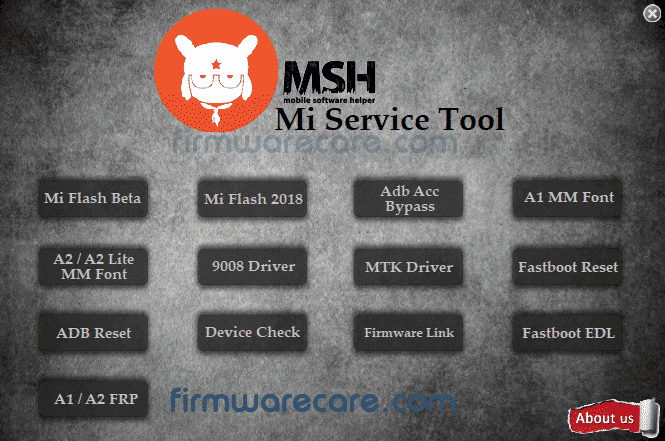 MSH MI Service Tool is a small application for windows computer created by MSH Team, which allows you to flash the stock firmware on Xiaomi Smartphone. It comes with various useful tools including Xiaomi Mi Flash Beta, Xiaomi Mi Flash 2018, ADB Account Bypass, Xiaomi A1 Myanmar Font, Xiaomi A2, A2 Lite Myanmar Font. It also comes with the Qualcomm 9008 Driver which allows you to connect your Qualcomm device to the computer. MTK Driver allows you to connect your Mediatek powered device to the computer. It also comes with the Fastboot Reset Tool, which enables you to quickly reset the Fastboot devices, ADb devices. It also allows you to device the complete information about the Xiaomi Smartphone and download the Stock firmware of the Xiaomi Device. It also allows you to boot your Xiaomi device into the EDL Mode and remove the Xiaomi A1 and Xiaomi A2 FRP protection in single click only. In order to use the MSH MI Service Tool, you need to install the Universal ADB Driver on your computer. [*] Compatibility: The MSH MI Service Application runs perfectly on Windows XP, Windows Vista, Windows 7, Windows 8, Windows 8.1 and Windows 10 (32 bit and 64 bit). [*] Credits: MSH MI Service Tool is created and distributed by MSH Team (developer). So, full credits goes to MSH Team (developer) for sharing the tool for free.